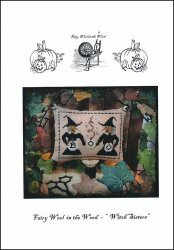 Witch Sisters [W5101] - $9.00 : Yarn Tree, Your wholesale source for cross stitch supplies. Cross stitch pattern by Fairy Wool in the Wood. Two witches holding white pumpkins with letters spelling the word "Boo". Stitched on #4178 Belfast Linen vintage country mocha. Stitch count 77w x 59h.